Has anyone flashed the UEFI with 1.0.7 or 1.0.8? And if you have what method did you use to flash the UEFI? Presently I'm on the original UEFI 1.0.1. The reason I'm asking is that I copied the 1.0.8 to a bootable Fat 32 USB and ran it with the UEFI in Legacy. It started the Flash but then I received a Run Time Error of R6000 which was a Stack Overflow. I went into the UEFI and changed back to UEFI and booted into Windows 10. Windows didn't seam so stable so I cloned from the 2nd drive that I have and had done a fresh clone before proceeding with the above procedure. My primary drive is a Crucial MX300 1TB SSD and the 2nd drive is the 1 TB Toshiba HDD that came with the 8920. The UEFI is setup so that if the UEFI does get hosed the UEFI is to recover from the UEFI recovery files on the HDD. I also have a backup UEFI 1.0.1 BIOS_IMG.rcv on this USB that could be used in a worst case scenario. After this Windows has been stable and working well as before starting this process. You cant flash UEFI Bios that has security certificates in DOS offline. Current Bios requires WINDOWS and INTEL Management Engine. Systems such as INTEL AMT HECI SOL come with a Management Engine (ME). The ME requires firmware and drivers and is RUN from Windows PE Command Prompt not DOS. The Intel Management Engine (Intel ME) refers to the hardware features that operate at the baseboard level, below the operating system. Intel requires you to save certificates for a given environment to the management engine so that a PC can authenticate prior to being granted network access. No such certification or environment exists in INT 13 WIN9X FAT32 DOS. You are not going to be able to save the UEFI bios and certificates offline unecrypted. Nor will the entire contents of the BIOS be able to be saved to a file. My recommendation is to run the BIOS update utility from Windows environment. That said, Dell's installation instructions also offers two methods for running the BIOS update utility from the DOS environment, one if Legacy Boot mode and the other if UEFI Boot Mode for non-Windows users. Obviously Dell seems to prefer the Windows environment if that is what you are running. Installation instruction details are on the BIOS update page. After looking over your information that I have not seen before I decided to try the Windows method. I put the XPS8920_1.0.8.exe file on the desktop. I went into Configuration System and under Services checked the Microsoft box and Disabled all other services. I then rebooted and ran this file from the desktop. It rebooted and came up into the Aptio Setup Utility for Flashing the UEFI. The program ran thru the process of updating the UEFI and rebooted twice and the second time it came to being able to use the F2 key. The UEFI did show that it was now on 1.0.8. I went thru all of the fields checking to see if anything had changed and it was all the same except that in Boot; File Browser Add Boot Option there were two different ACPI information than before. I logged those on the information that I keep for the UEFI. I exited UEFI and did an F12 and under Legacy the only thing there was is Network. Where before I had Network, CD/DVD Rom, USB, and HDD1. I went back into the UEFI and set the Boot to Legacy saved it and did another F12 and this time I saw under Legacy the Network and HDD1. I went back into the UEFI and changed it back to UEFI and exited and did another F12 and saw the same thing. This time I put in a bootable USB and did another F12 and on the Legacy menu the USB showed up. I was able to boot from the USB. I would imagine that if I put in a bootable DVD I will also would see the CD/DVD Rom of which I'm going to try to prove it out tomorrow. SpeedStep thanks for your help. And the 1.0.8 went well from Windows 10 using the above method.
" instructions also offers two methods for running the BIOS update utility from the DOS environment" I disagree. Neither MSDOS6.22 Nor FreeDOS Nor WIN9X DOS are allowed for hard driveboot in UEFI even when CSM is on. The "executeable" is not a rom file. USB Flash Drives F12 booting is not a typical dos environment. This is because Hard drive MBR boot records and Partitions are not allowed for UEFI BIOS. Dual Boot on Fat32 went away after XP became no longer supported. There are no separate Rom files and flash utility from DOS nor are there Dell Files to do so. The ME (Management engine is required) This is why windows PE is required as well as the ME drivers. A long time ago they made Floppy to bootable dos images. But they since removed Floppy drives this point becomes useless. 2. Power on the system, then go to BIOS Setup by pressing F2 and go to "General > Boot Sequence > Boot List Option". 3. 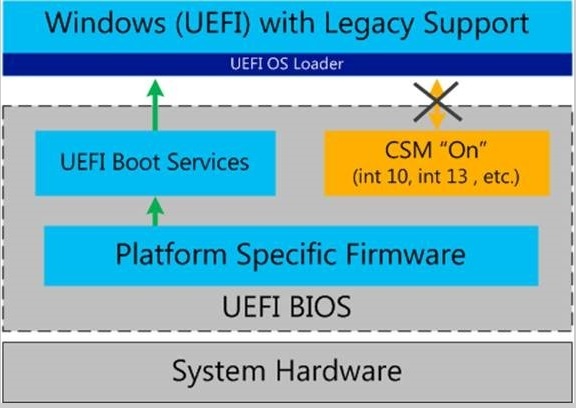 Change "UEFI" to "Legacy" of Boot List Option. 8. Go to BIOS Setup by pressing F2 and go to "General > Boot Sequence > Boot List Option". The above method is what I followed and I received the Run Time Error R6000 of Stack Overflow. So I know that this method with FreeDos anyhow does not work. But I just proved out to myself at least that the Windows method does work. This also proved that the file did not have a problem because it was the exact same file. With Bios flashes I was used to using a bootable DOS Fat32 USB so that is why I used this method. I was unsure of using Windows for flashing. But now at least in this case it worked with the preparations that I took and I'm more comfortable with it if needed again in the future. The only question I now have is what if you can't get into Windows. Now if it's a UEFI problem with the HDD recovery enabled in UEFI it should apparently use the files stored on the HDD to recover the UEFI and be able to boot into Windows. Then Dell also laid out that you could take the XPS8920_1.0.8.exe file or whatever UEFI version you are on and change it to BIOS_IMG.rcv and at power up press the Ctrl & Esc and hold, (this procedure is for certain desktops since 2015) until you see the Bios Recover Screen appear. In my case this would be with this file on a USB. It has to be the UEFI that you were on and now with my computer it would be the 1.0.8. At this time The file has to have this naming convention for it to work. I have taken the 1.0.1 file with this name and deleted it off the USB and now added the 1.0.8 with this name. Apparently this will recover your UEFI if you can't boot from it and the HDD recovery method does not work. But of course at this time I have not proven either of these two procedures and hopefully never will need too. But I want to know what to do in case something happens. On another note I mentioned that I would try a bootable DVD to see if it come up in Legacy with F12 and it didn't with the Boot in UEFI. But as stated above the USB does no matter if it's bootable or not in UEFI mode. The only way I can see the DVD and HDD1 in Legacy with F12 is if the Bios is in Legacy mode. This is different from 1.0.1 because in UEFI mode using F12 I could see the Network, USB, CDROM, and HDD1 all of the time of which I liked better. To answer your question about updating the BIOS if you can't get into Windows, I would say that I would be more concerned with reloading Windows than updating the BIOS. I don't see a situation where updating the BIOS is more important than getting Windows working again. With regard to your DVD booting issue in UEFI, see if this helps: www.dell.com/.../how-to-enable-boot-from-dvd-option-with-uefi-boot-mode-enabled--windows-8--81--10- Also with UEFI boot, the bootable DVD must be in the drive when you press F12. I have just the opposite concern because I clone the primary SSD drive at least monthly to my 2nd drive and also an external USB 1TB HDD. I use Easeus To Do Backup and have never had a problem with clones. I keep windows clean with Emisisoft Anti-Malware, Malwarebytes Anti-Malware, and McAfee Live Safe. I also use Aces Registry Cleaner and with these tools I vary rarely have a Windows problem. And as I did with this UEFI flash I did clones and with this computer it takes 50 minutes SSD to HDD clone and 1 1/2 hours for the SSD to External USB clone. Clones have saved me many times from bad MS updates and until running my present Anti-Malware and Anti-Virus programs it saved me from Malware and Viruses. I'm a firm believer in regular clones. And on my old XPS 630i I had a dual set of WD Velociraptors that I backed up regularly since I was running in Raid 0 besides an external 1 TB USB. That is one nice thing about Easeus To Do Backup was that you could clone a set of Raid 0 drives to 1 External USB drive and clone back to the Raid 0 drives and it worked perfectly. Since I'm not familiar with UEFI and on a learning curve I'm trying to gain all of the information that I can and as you have seen in an experimental stage figuring out what works and what doesn't for a UEFI flash. The one thing I do like about the UEFI is if these backup procedures work such as the UEFI recovery from the HDD and the BIOS_IMG.rcv file UEFI recovery are both a bonus if they work. I would really like to know if anyone has performed either of these procedures. With the Bios if it failed you usually were going to replace the chip or now days it's the whole motherboard. With the MB what a money maker that one is and so why many people don't want to do a Bios or UEFI flash. I wouldn't have done this flash, except that to use Intel Optane you have to be on at least 1.0.5. And I will be doing this at some point once Intel gets some things that I'm concerned with worked out. Plus right now I have another 10 months of warranty and as long as I'm doing a Dell approved procedure and things go awry I'm covered. And thankfully I have a 2nd computer if that were to happen so I wouldn't be dead in the water. On the DVD issue it shows up in UEFI when doing an F12 with or without a bootable DVD. But it used to show up under Legacy when doing an F12 and doesn't now with or without a bootable DVD. I have looked at the above link before, but it doesn't address the issue that I'm talking about. When I first loaded this computer with Windows 10 and then began checking things out at boot you didn't even see the screen showing F2 or F12. Then at boot I just hit the F2 key to get into the UEFI and went into boot and changed from UEFI to Legacy. It then showed the screen with F2 and F12. And When going into F12 I saw all of the devices mentioned up further in this thread in both the UEFI and Legacy. And I saw the same thing when I changed back to boot in UEFI. This was with 1.0.1, but now with 1.0.8 in the Legacy part of F12 I only see Network or if I have a USB in I will see the USB in both menus. Below is what it lists normally in 1.0.8. Then if I put in a USB it shows up on both menus. If I put in a DVD it shows up only on the UEFI menu. I have converted most of my bootable programs to USB so if only Legacy was available it wouldn't be a problem. But it would be if I needed the CDROM. In 1.0.1 I liked the fact I could see Network, HDD2, USB, and CDROM in both menus all of the time no matter if there was a USB or DVD in the port or drive.